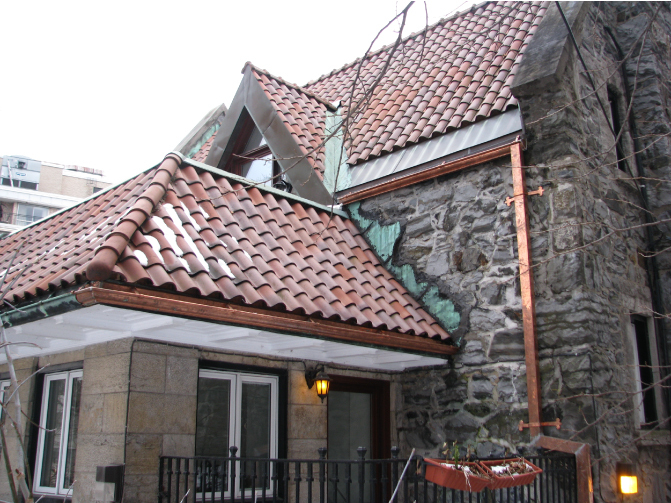 Make the right choice with Primeau Metal Inc.
Good eavestroughs can save you from many worries while helping preserve the resale value of your home. If yours are causing problems or you’re buying them for the first time, we suggest that you investigate the alternatives. The ideal eavestrough has to be sturdy, weather resistant, collect fewer leaves, and preserve its appearance for many years. To guarantee this, it should be installed with care by experienced professionals. You should also check the type of eavestroughs you’re buying, along with the quality of service and the reputation of the company. Plastic: Very flexible, bends and cracks easily. Not very resistant, its color fades, and it’s also toxic with extremely high dioxin levels and banned in many countries due to its numerous threats and environmental problems. Pre-painted aluminium: A rather soft metal, malleable and easy to install. Less rigid and durable than Galvalume® steel and with a large expansion coefficient. It is subject to distortions, leakage, colour fading and is also toxic for the watering of plants, animals and humans. Copper: Long-lasting, it adds a rich look to your house. Pre-painted Galvalume® steel: The toughest eavestrough material available. Coated with an alloy of exceptional properties, it provides superior resistance. Its manufacturing requires costly, high tech equipment. The environmental choice. 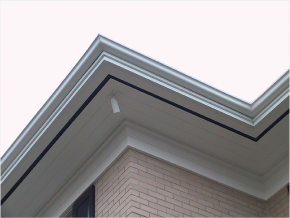 Most eavestroughs are designed with the back of the same height as the front, which facilitates the water infiltration in the eaves, increases the ice buildup in winter and the breaking risk when the snow melts. To be effective, the back of eavestroughs must be 1 to 3 inches higher than the front, so that it can be installed under the shingle drip. Because there are many types of houses, your eavestrough must be the right kind for your home. You need to consider the condition of your roof, the environment, the necessary accessories, the quality and the choice of available colours. Poorly installed eavestroughs can cause damage and be expensive in the long run. A lasting installation should be done by professionals who take all the necessary time. A proper installation adapted specifically to your home will prevent future problems. Selecting the right company for your eavestroughs is crucial. The best guarantee a company can offer is its reputation and expertise. A reliable company should offer all of the necessary features to justify your investment and dependable service before and after the installation.